ampEducator Blog: Attendance in ampEducator - A Refresher Guide. Attendance in ampEducator - A Refresher Guide. Attendance is recorded by staff (usually instructors assigned to the Course) for each Course. Before you can record Attendance for a Course you must add Events to the Course. "Events" can be Attendance Events or Other Events (that do not affect Attendance). If there are no Course Events added then nothing will display under the Attendance Tab. Before you "Add Event(s)" to the Course, the Course Attendance Type needs to be set. This depends on the requirements of the Course as some schools are Clock Hour schools rather than Standard Attendance schools that just need to record Present, Late or Absent. Attendance Type. There are 2 types of Course Attendance in ampEducator "Standard" and "Hourly". When starting (or importing) any Course the Attendance Type under Course Details defines what Course Attendance input options will be displayed for Instructors (or Staff with access to the Course) to enter for Students once Course Events are added. Note: There is also Auto Mark Absent. If the Auto Mark Absent option is checked under Course Details > Details > Attendance, ampEducator will check the previous day for no Attendance entered (ie. empty attendance fields) and if no Attendance was taken the Student will be automatically be marked Absent for the previous day by ampEducator. Otherwise if Auto Mark Absent is not checked then Instructors (or Staff) will need to mark Absent for each day the Student is away for Absent to be counted. If "Standard" Attendance Type is selected the following will be presented under Course > Attendance Tab for each student under each Course Event that is scheduled. To edit the Attendance for the Course Event, simply click the Date. Tip: To save time we have added a shortcut to make all Students Present or Absent. Checking this off below the Date assigns this Attendance outcome for all Students. To clear the list check the (-) button. Check Mark = Present, If Attendance Hours for the Event are entered - then 100% will assigned to the Student. X = Absent, 0% Hours Assigned to the Student. A = Authorized Absence, No Hours assigned, Student was Absent with Reason and Absence not counted against Student. Click X, then A to set this Attendance outcome. An example of this would be Absent, but had doctor or dentist note and a note of this would be entered under the Attendance details by clicking the magnifying glass. Example 1. A student can be Late for class L and you would select L for this and the default time would be deducted from the student. (We set this at 15 minutes but you can edit this to be whatever you require). L = Late, applies the Default set minutes under Username (Top Right) > Institution Config > Courses > Defaults > Default Late Amount (min) = 15 minutes (or whatever you set here). Example 2. A Student Left Early. For this you would select L, then ! 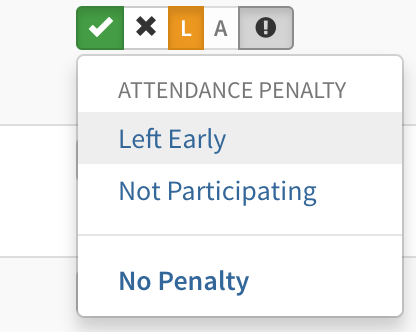 to pick Left Early from the Attendance Penalty custom list.
! = Late Penalty, applies the Late Penalty that you select. Administrators can edit this list and the penalty minutes under Username (Top Right) > Institution Config > Courses > Penalties. Example 3. A Student was late for class and then left early as well. For this you can select "L" and "!" to indicate both outcomes. 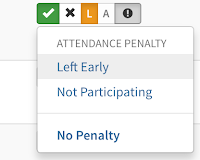 To edit the penalties (if required) you can do this under the magnifying glass for the student Attendance Details. See Below. If "Hourly" Attendance Type is selected a box will appear allowing the Instructor (or Staff) to enter the hours as required. Tip: If the shortcut at the top is checked off below the Date - this assigns the Hours available to all Students for the Event (ie. If each event is 1 hour, then 1 hr will appear in all the students boxes). To clear the list check the (-) button.